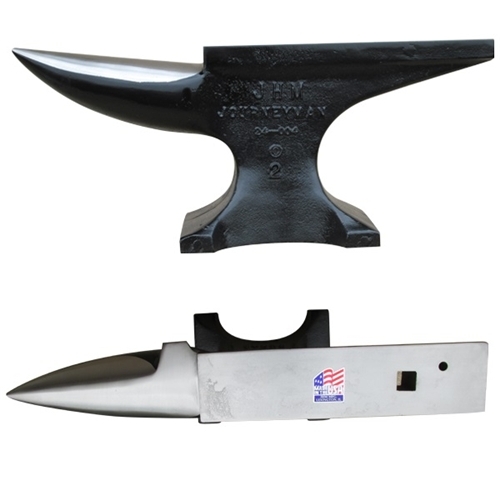 JHM Anvils are made in the U.S.A. Since 1983, JHM anvils have been cast from the highest quality metals in Peaster, Texas foundry and are carefully machined by hand. Anvils over 125 lbs ships by Common Carrier (truck) class 60. This anvil can ship UPS. Shipping charges may vary as UPS only provides us with an estimate. We will contact you if there is a variance. When JHM started making anvils, American-made anvils had a flat, round horn. The sides were rounded and the top was flat. But it's pretty hard to make a round shoe on a flat surface. Hind shoes are usually made on the heel of the anvil, front shoes are usually made on the horn. Today, each of the six JHM models is specifically designed to help professional farriers and blacksmiths face the various challenges of shoeing large as well as small hoof horses, whether in competition, at a customer's location or in the shop. Key features include the four-inch face, three-inch dovetail, turning cams, drop side and square clip horn. Even with so many unique features, JHM anvils are not more expensive than other brands.